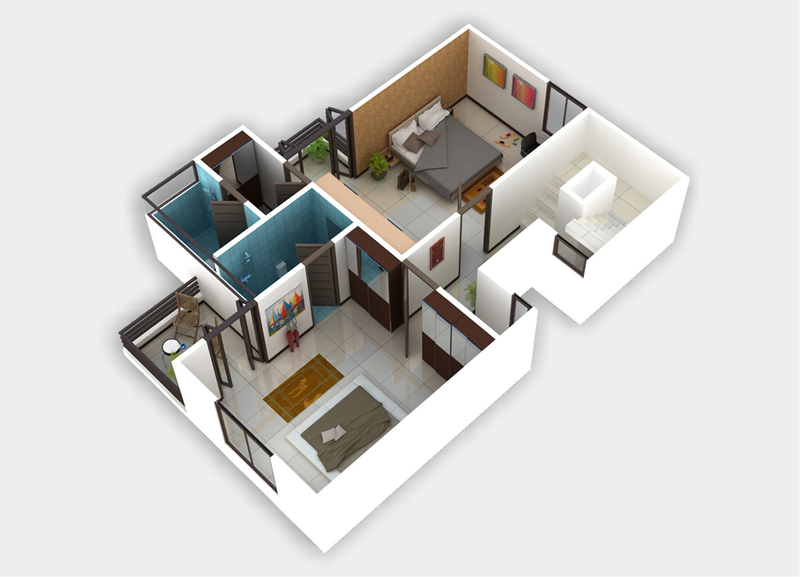 Did you ever want a home inside a club within municipal limits? 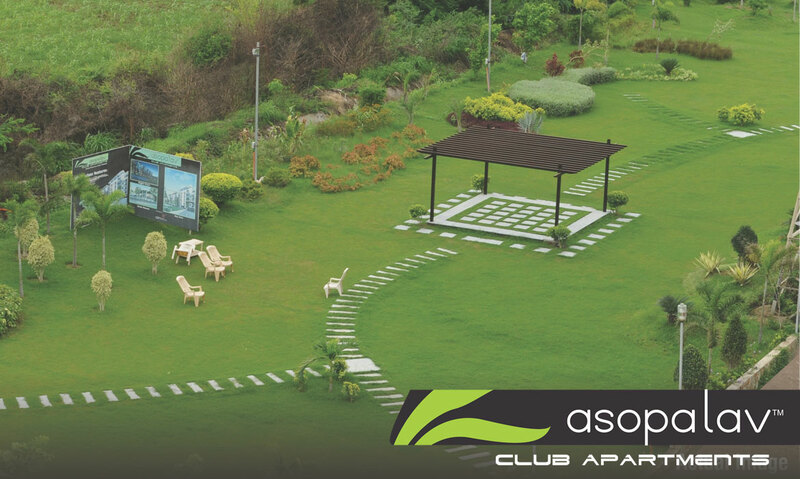 Presenting to you ASOPALAV CLUB APARTMENTS, a uniquely designed project that has a expansive club on one side and apartments which are going to be talk of the town on the other! A warm inviting abode for you and your loved ones, a home away from the crowd and chaos of the city, yet connecting to all parts of the city. 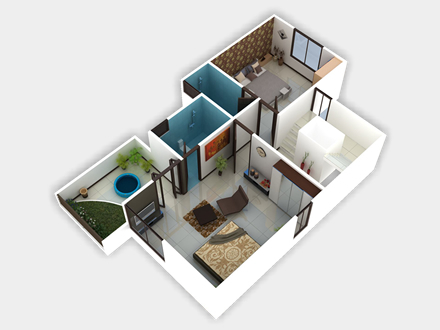 VASTU COMPLIANT Premises for positivity and growth. 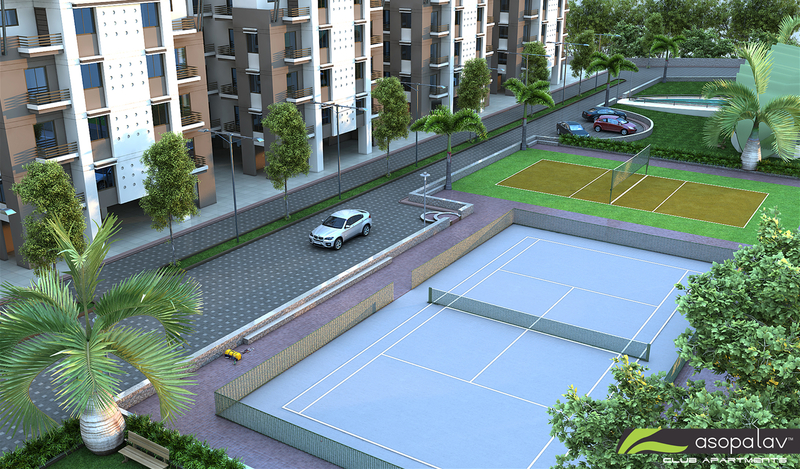 Why a home at ASOPALAV CLUB APARTMENTS? 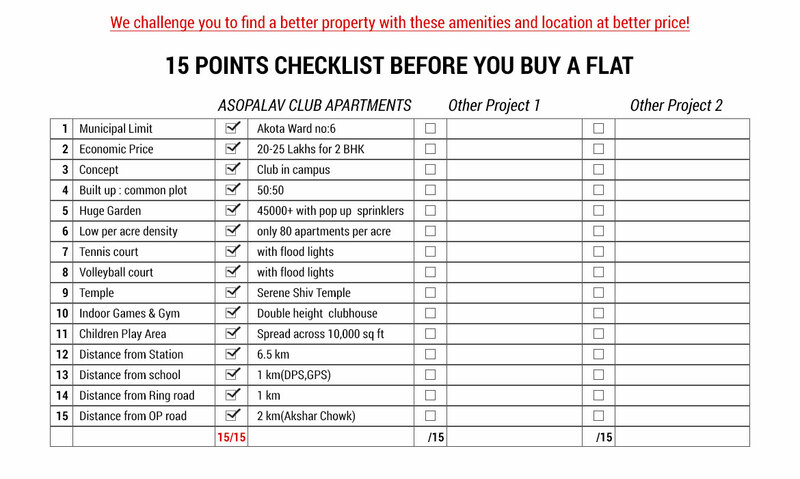 You not only buy a home at ASOPALAV you buy a CLUB lifestyle. Your children get spaces and international quality courts to become sporting champions, elders in the family get their space to fulfill their spiritual needs and you remain FIT FOR LIFE!!! 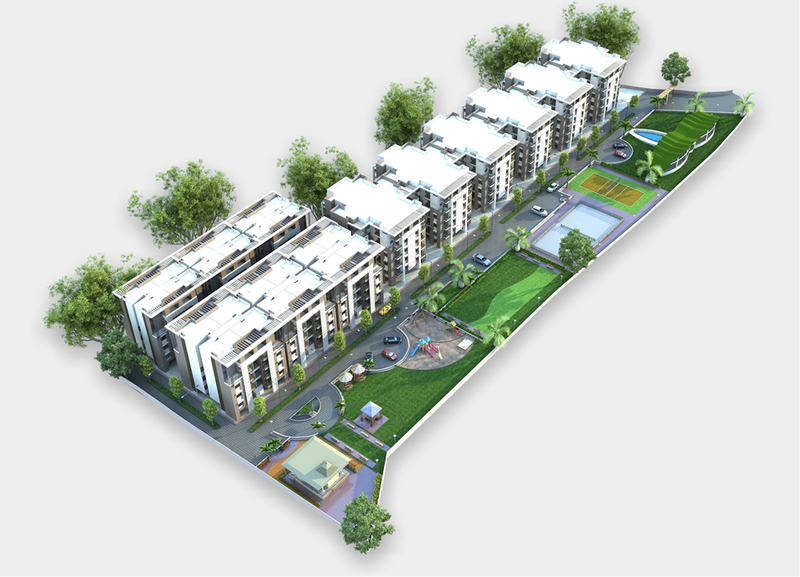 Kalali Road (OP Road Extension) has only high end projects and ticket size is around 50 Lacs (Flats or Bungalows). 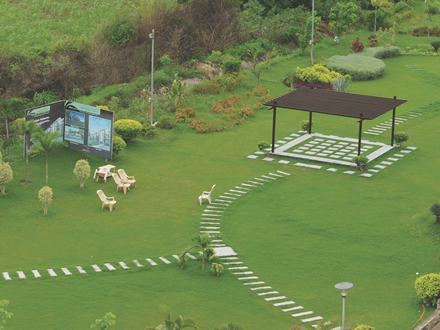 We are the most affordable here with maximum amenities! WE CHALLENGE YOU TO PROVE US WRONG!!!! 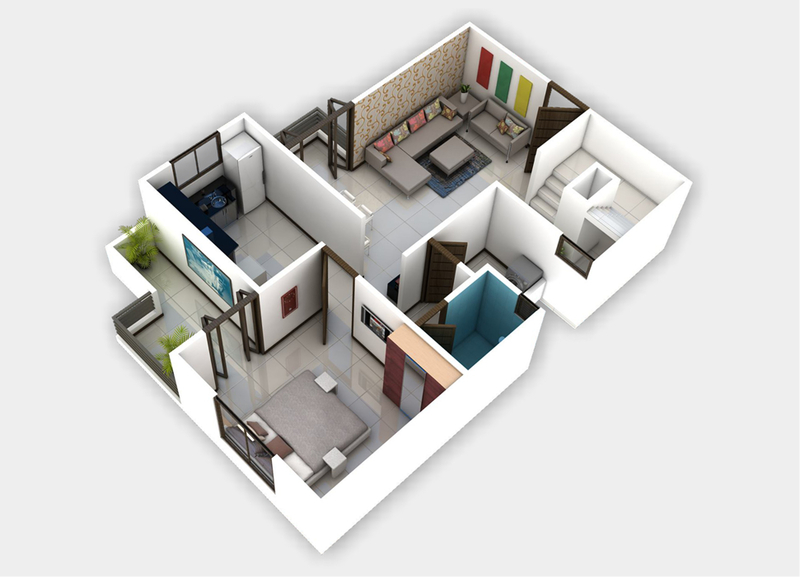 Situated in an area with surroundings like Hotel Marriot, Mercedes Showroom, AUDI Showroom, BAPS Hospital, upcoming Wellcare Multispeciality Hospital (Dr.Bharat Modi),4 CBSE schools. 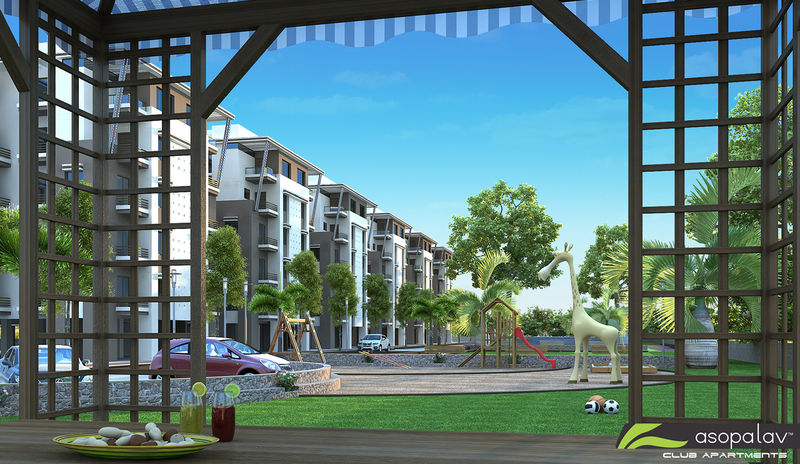 Value Additions For a good life! Life, as we know it, is all about expecting more. 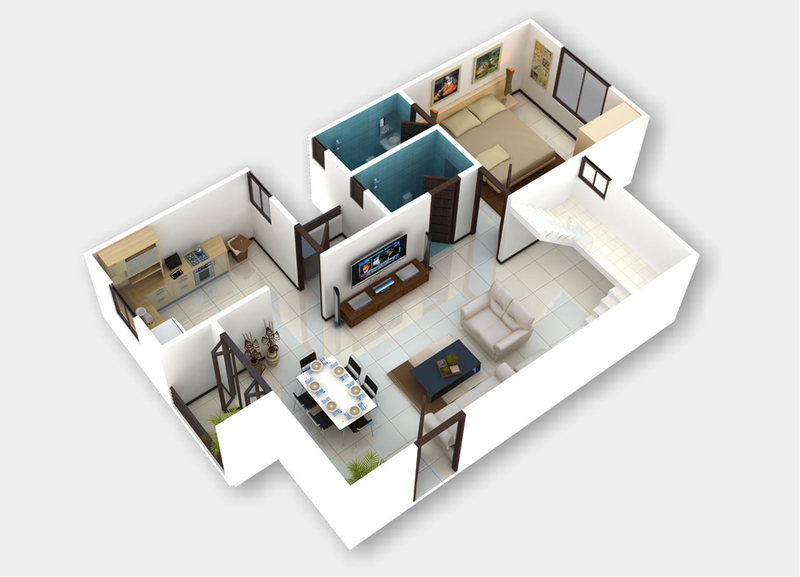 More Space, More Amenities, More Freedom and More Value for your INVESTMENT. 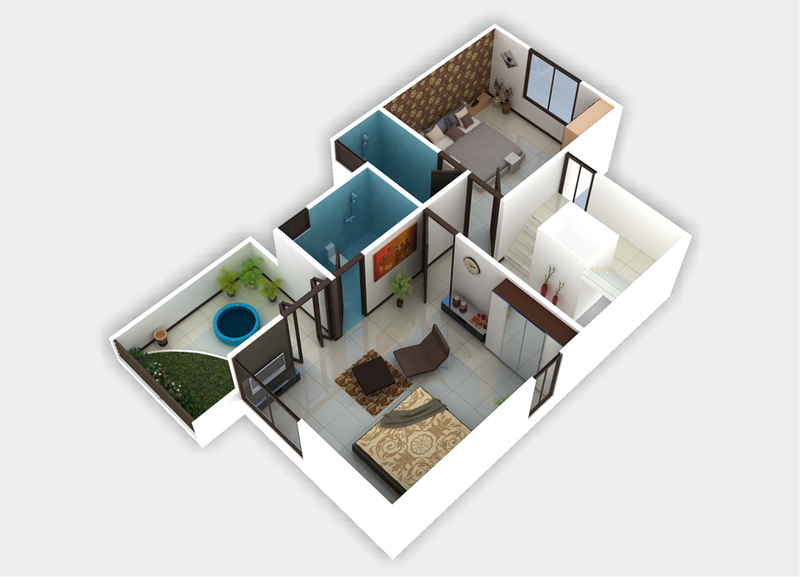 We understand it, hence we have a home that not just satisfies you…..it thrills you! 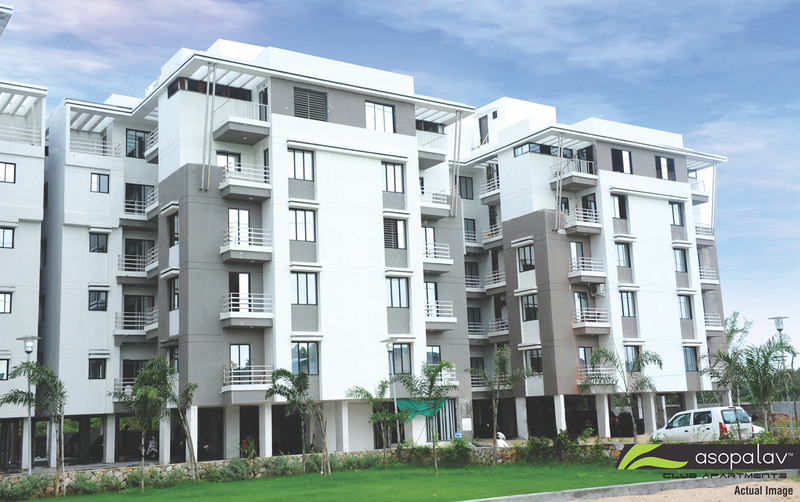 Its an elite habitat that epitomizes luxury living. 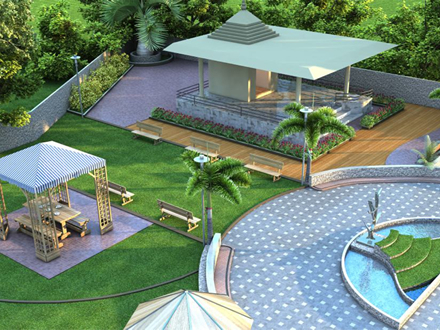 Designed to complement your lifestyle. 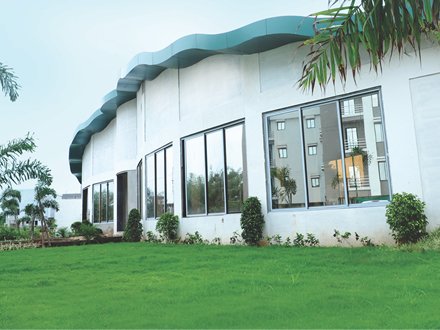 Asopalav makes for a privileged address. 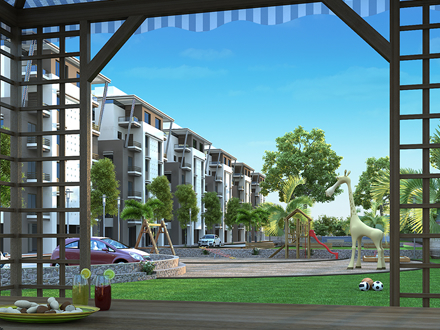 It’s a distinctive and affordable abode in a world-class gated community you’re looking for, be assured, you’ve just been introduced to the finest practical luxury in town. 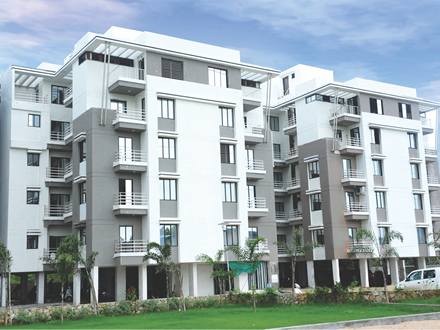 Well designed RCC framed structure using superior quality materials, as per structural engineer's design. Vitrified Hoofing in al rooms. 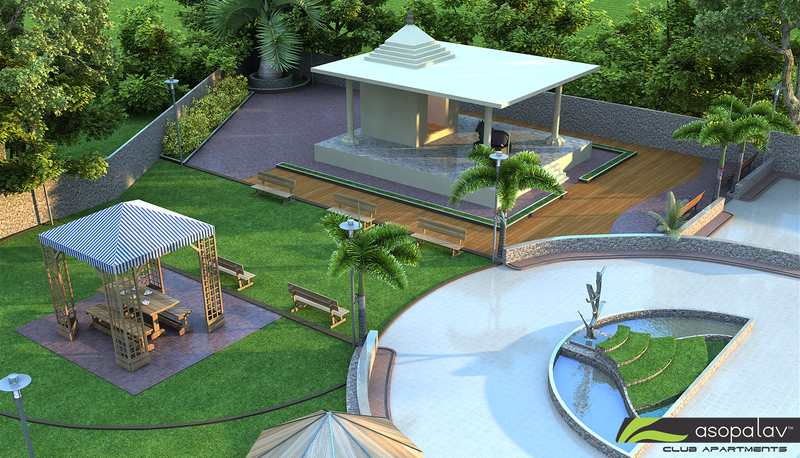 Wash area covered with Kota and glazed tiles dodo. 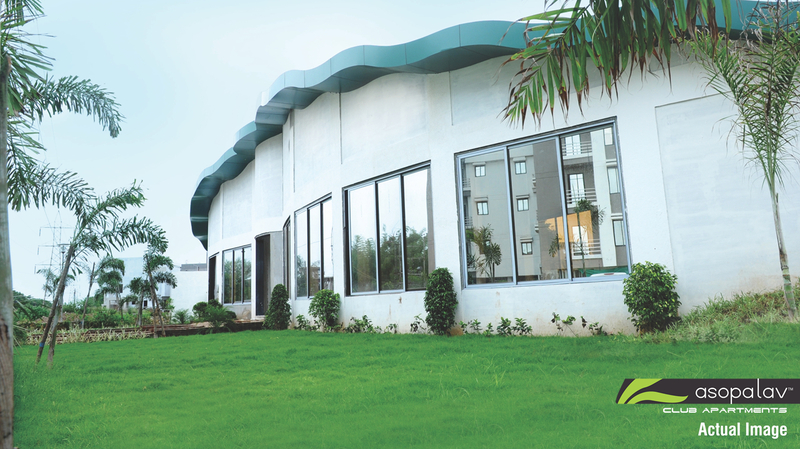 Power coated Aluminum Sliding windows with tinted glass and safety grills. 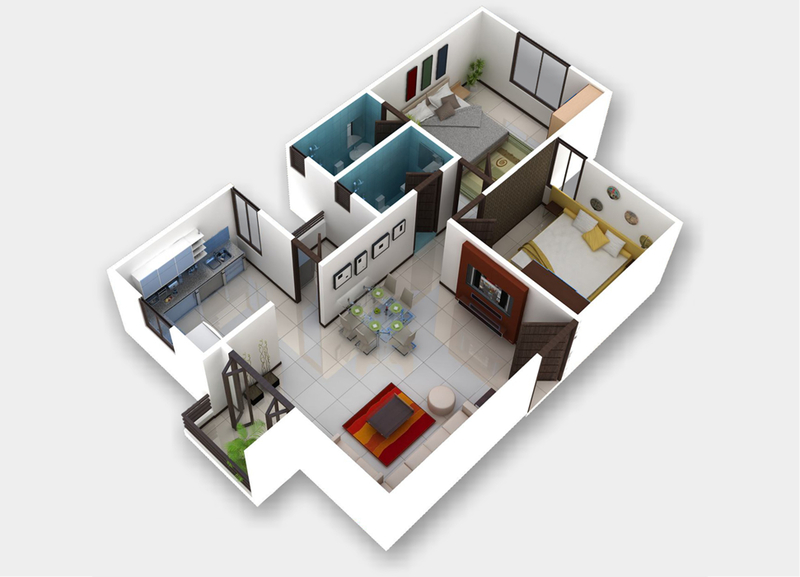 Laminated flush doors in all rooms with elegant fixtures. Designer bathrooms with branded sanitary ware. Hydro-tested concealed plumbing with branded CP fittings. Wall tiles up to lintel level. 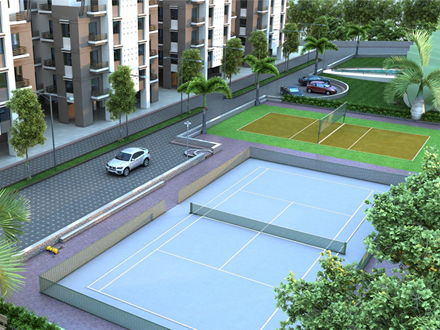 Underground and overhead water tanks. Granite Platform with branded SS Sink. Well equipped with provision of water purifier & sufficient electric points. 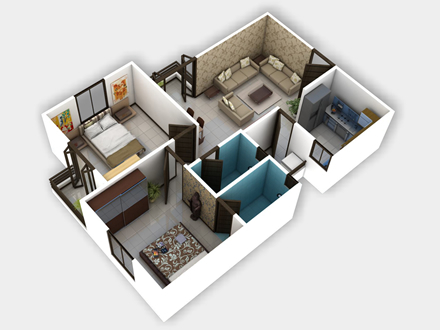 Telephone & TV points in Living Room & Master Bedroom. Interior walls finished with Acrylic washable distemper, Asian Paints/ Berger/ or equivalent. The best part of moving into Kalali to discover how quickly you can move out of it! 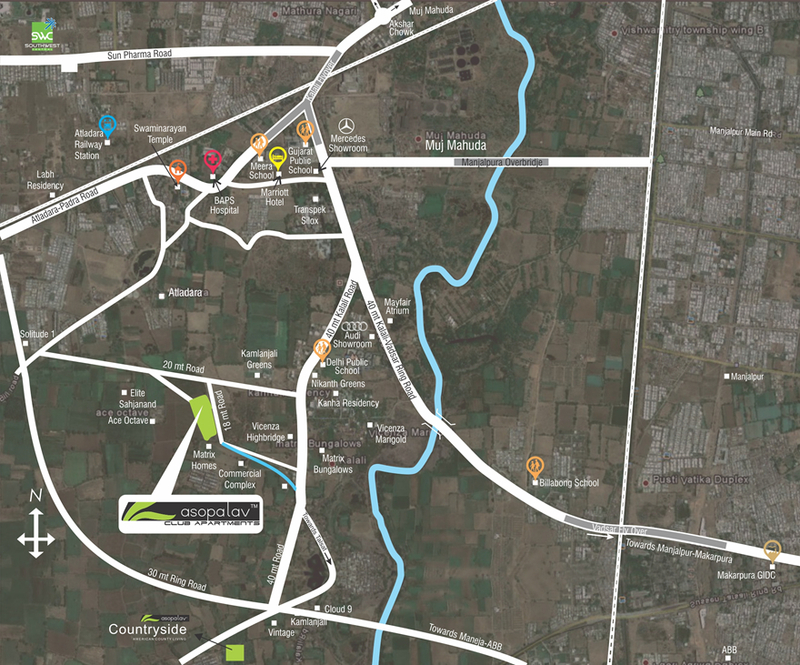 Located just 1.2 km from Old Padra – Vadsar ring road and 300 meters from 40 meter road connectivity, having superior infrastructure facilities, the area is one of the fastest developing commercial and residential destinations in the city. 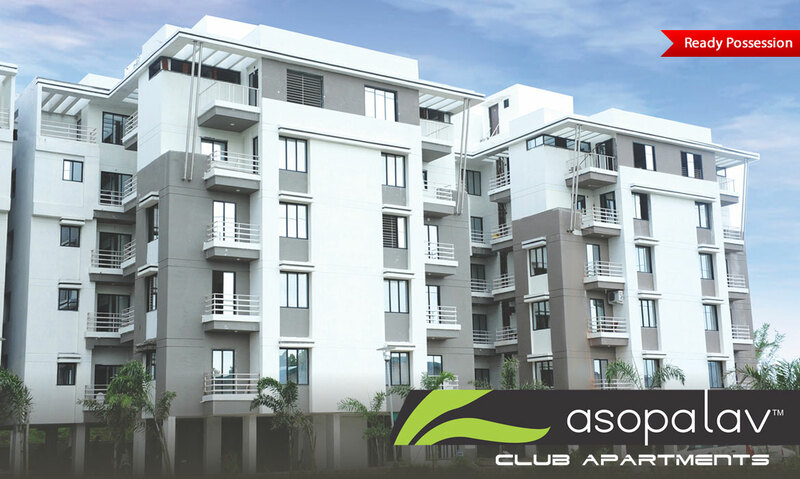 ASOPALAV CLUB APARTMENTS being a mere 2 km drive from Old Padra road, is also easily accessible from Akota, Manjalpur, Atladra, Makarpura GIDC, Por GIDC, Makarpura N.H.8. Surrounded by international schools and temples! 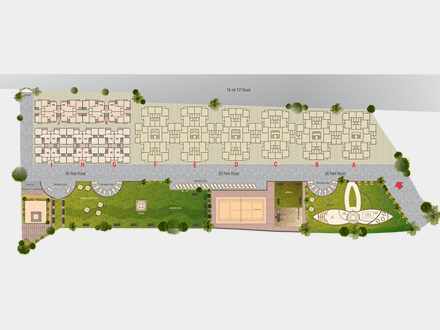 Site : Asopalav Club Apartments, Near Delhi Public School, Kalali Road, Vadodara.